The upgraded Rexel Auto+ 300X with SmarTech means that your shredding has just got smarter. With the addition of the Auto+ 300X SmarTech real-time mobile app, not only will you be able to automatically load and shred 300 sheet of A4 paper in the auto feeder, users can now remotely manage their shredders to provide enhanced performance and productivity. Rexel’s new Auto feeding ‘Smart’ shredders can now connect remotely with a free Android™ and Apple® app download, to any smartphone or tablet to display real live time notifications about your shredding job and update the user and manager as to the status of your SmarTech shredders. The new app tells users when their job is complete, will notify if there is a paper jam or when the bin is full and requires emptying, and even allows the user to re-order consumables like oil and collection bags, or to purchase a service contract. Key benefits will include; no more standing, checking, waiting or guessing when your shredding job has finished, instant knowledge if there are any operational issues with your shredder, and peace of mind knowing that you should never run out of supplies. No more costly downtime of checking on the maintenance of multiple machines, prompting action when required and enhancing you GDPR obligations. The Smart functionality of the Rexel Auto+ 300X small office or personal shredder, which automatically cuts paper to 4x40mm cross cut shreds to security level P-4, is the winner of the European Office Products Awards, Technology Product of the Year. No need to stand and hand feed it, or even remove staples or paper clips first, simply load the A4 chamber with up to 300 sheets (80gsm) or 350 sheets (70gsm) for automatic shredding or shred up to 8 sheets (80gsm) through the manual feed slot. The Rexel Auto Plus 300X with SmarTech will also shred staples, paperclips, and other media like CDs and credit cards. 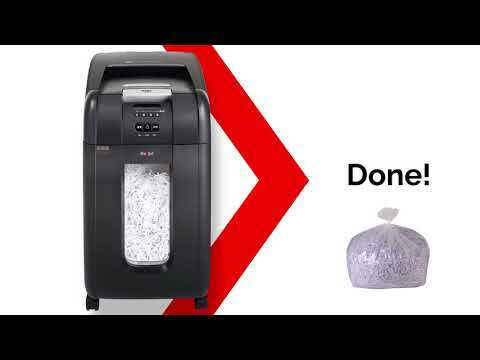 Independent tests have shown that you can save up to a staggering 98% of time shredding by using the Rexel Auto+ 300X autofeed shredder compared to a standard hand feed shredder. If you load 300 sheets into the Auto+ 300X it will take approximately 12 minutes to complete the process. Featuring a 4-digit security password function that locks sensitive documents into the shredder feeder for additional security, the Auto+ 300X with SmarTech has a 40-litre capacity pull out waste bin with a handy viewing window that holds up to 450 sheets of shredded paper requiring minimal emptying. Is also ultra-quiet with noise levels at less than 60dba, and features LED indicators to alert the user when the feeder door is open, the waste bin is full, plus a reverse function for when the machine has been overloaded or jammed. NB. Due to the unique auto feed technology, the Auto+ SmarTech 300X only accepts standard A4 copier paper (up to 80gsm). Any paper with a glossy finish or anything thicker such as folded paper or card should be shredded through the manual feed slot. Also note that A5 sheets (or larger sheets such as A3 roughly torn in half) are only accepted through the bypass slot and will not work in the Auto Feed system. The use of a P-4 shredder such as the Auto+ SmarTech 300X will aid your GDPR compliance.